Sometimes it is really hard to put a finger on just what your style is or even find your style. For the longest time, if asked, I would say that my style was Cottage Style. While I love cottage style, I have recently found that my style may be more like Cottage / Vintage Eclectic. I have a love for all things old and eclectic…or pretty much anything that can tell a story. My breakfast nook (which changes on a daily basis), is filled with fun eclectic pieces. 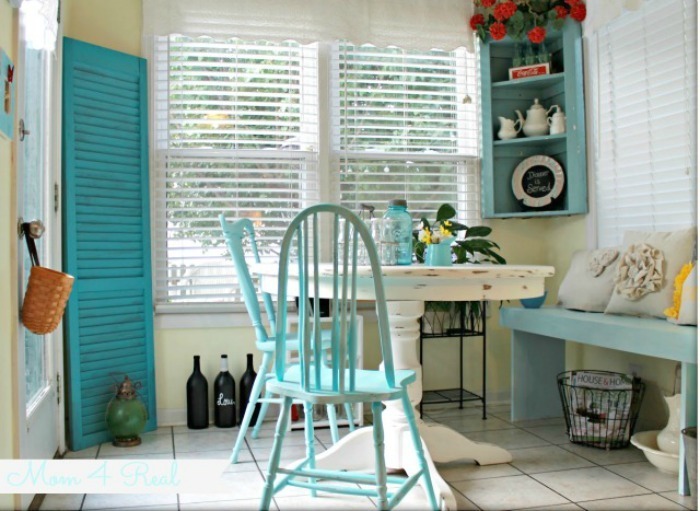 The mix of thrifted chairs, old shutters, an inherited tea set and an old tin Coca Cola six pack give it an eclectic, but comfortable feel. It’s truly my favorite place in our home. 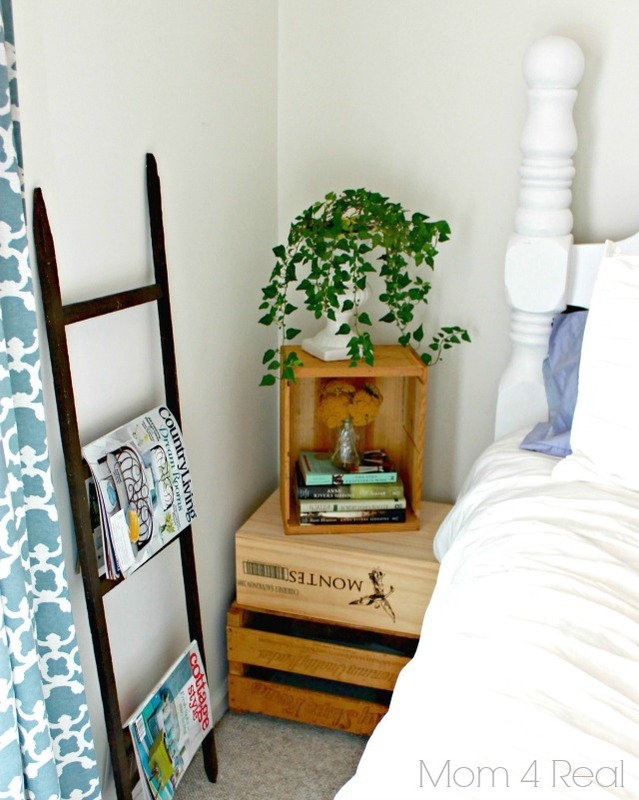 In our bedroom we have passed on matchy sidetables and opted for stacked wooden crates instead, and an old tobacco stick ladder holds my favorite magazines for bedtime reading. Even though I love old eclectic pieces, I also love new fabrics and other modern touches. There is something truly magical about mixing the old with the new to really bring a room together! In the kitchen, I definitely love having all of the convenience of modern appliances, but as far as the look…I still love different! Our home originally had cherry cabinets, but with a little paint and imagination, we changed it to suit our style more. 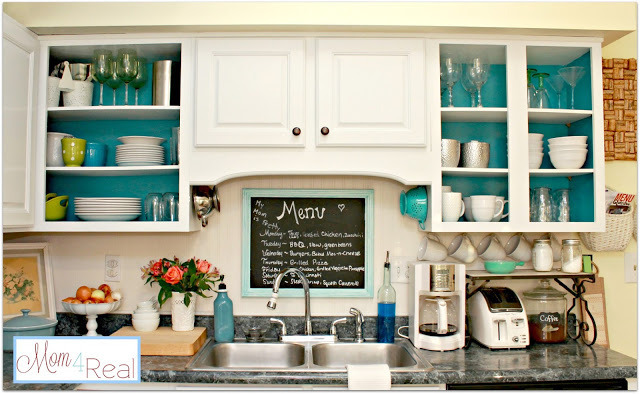 We removed cabinet doors and painted the insides along with adding some fun touches, like an old wine bottle turned into a dish soap decanter. These are inexpensive changes that pack a punch. We were in need of a coffee table, and I really wanted something that was fun. 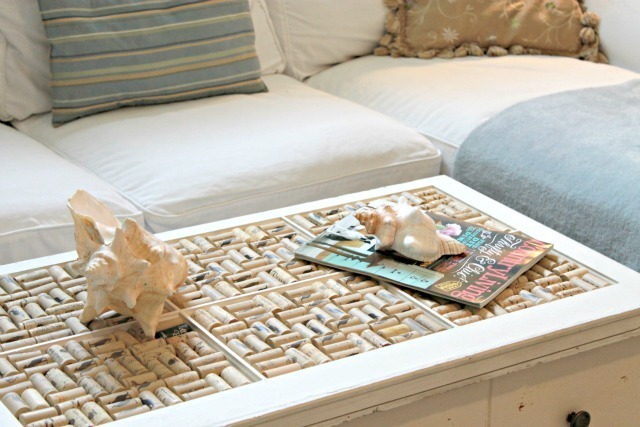 Replacing the top of an old chest with a recycled window with wine corks glued to it was the perfect solution. It’s fun and functional, and you’ll never see any water rings on this piece! 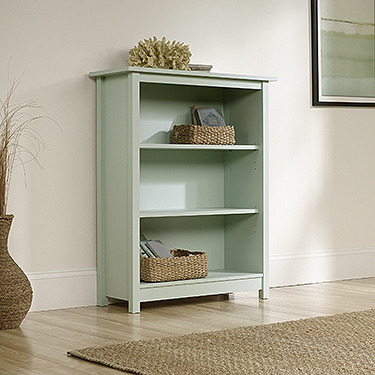 This gorgeous Bookcase from Sauder’s Original Cottage Collection would fit perfectly into any space! This fabulous Storage Chest would work perfectly as a coffee table. Look beyond the photo you see here and picture the chest with a throw blanket draped across one side and a tray on top of it with some cool vintage items! 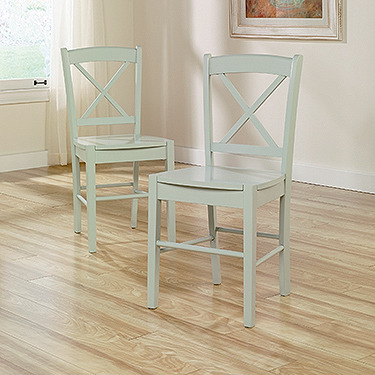 And…these super cute X Back Chairs would look fabulous paired with a white table! 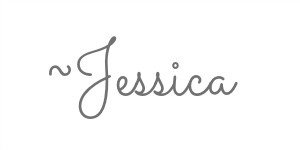 So, what do you do if your style is different, or you really don’t know what your style is? Take a look around. Take cell phone pics of things that inspire you, pull pages out of magazines and make a Pinterest board full of photos of spaces that you are really drawn to. Once you have those things in place, start paying attention when you are shopping…look for those things, and slowly integrate some of them into your home. Don’t be afraid of change! I promise you, I used to have a cookie cutter house, filled with what everyone else had, and it was boring. I was afraid that other people would think my home was weird. They don’t at all. I get more compliments on my home and how fun and comfortable it is, and my friends love being here! More importantly, we love being here…it feels like us! Whatever your style is, you should totally rock it! It shouldn’t take a lot of money to achieve, maybe just a little thinking outside of the box is needed! For tons of inspiration, follow Sauder on Pinterest, HERE!